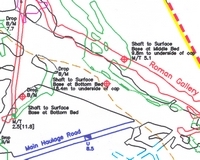 The DCC has carried out a large number of projects over the years ranging from excavating blocked shafts and levels to photography and surveying. As time has gone on, the amount of digging has decreased and studying the mines is gradually taking over. 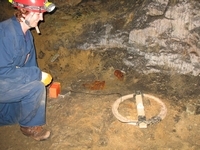 High grade surveying with a theodolite in West Mine Adding detail such as passage height and width. 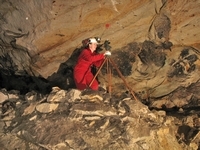 The tape represents the line surveyed by theodolite Using a total station to survey in the main chamber of Alderley Edge. 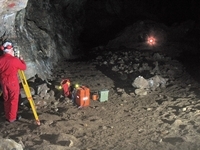 The distant light is a reflector placed over a survey station Using a total station on the surface to set up a giro on the base line at West Mine. 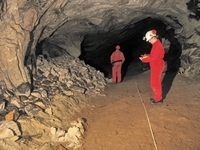 The giro was used underground to set a base line there The underground transmitter for radio location. The point is found on the surface when the signal is lost - the null point. 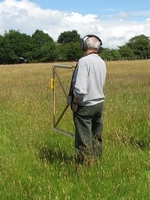 Using radiolocation on the surface to locate a signal transmitted from below ground Reflector set up on radiolocated station (marked by the stake). 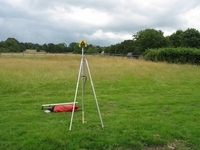 The surveyor in the distance is using a total station to locate the station accurately Part of the West Mine survey with passage outlines and locations of shafts. The colours represent different depths. The red and yellow lines are significant surface boundaries.